Super simple on body EDC today, wearing more formal clothes, the usual stuff bulges a little too much. Not pictured is my nexus 5 phone. The off body kit is exactly the same as usual, but on a Velcro panel in a handmade leather briefcase/satchel. Edited by Corbs, 29 December 2015 - 02:57 PM. 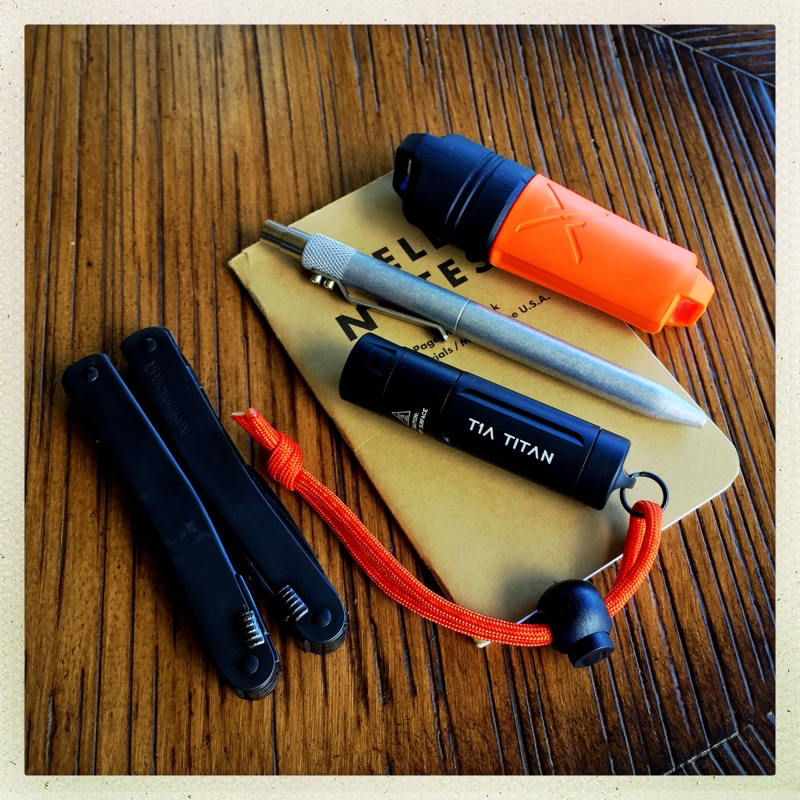 The keychain light is okay, but I've got a 200 lumen pocket flashlight en route from Amazon. Also...no guff about the cell phone. I used to be one of those people who was always glued to their smartphone, and decided to give it up a few months ago. There are some things I definitely miss, but I wouldn't go back now for anything. Missing from photo: 550 paracord (w/ jute core) bracelet. Guess I forgot to take it off. Edited by Browncoat, 16 January 2016 - 11:58 PM. 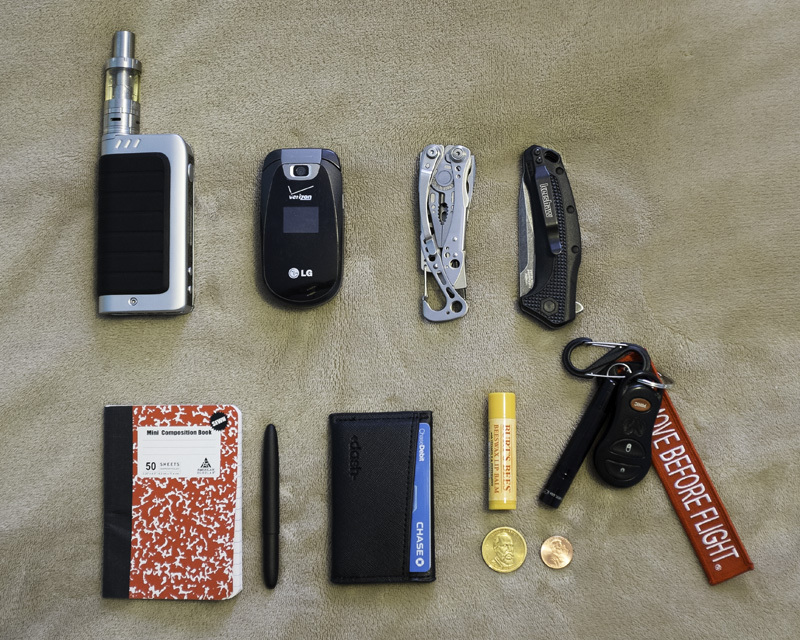 glad I found this thread to share my edc with you guys. I've been working on my edc for the past few months trying to find what I like best. Edited by FSD_MOORE, 23 January 2016 - 08:22 PM. Edited by FSD_MOORE, 23 January 2016 - 08:28 PM. Minus the mug this is with me in some form daily. 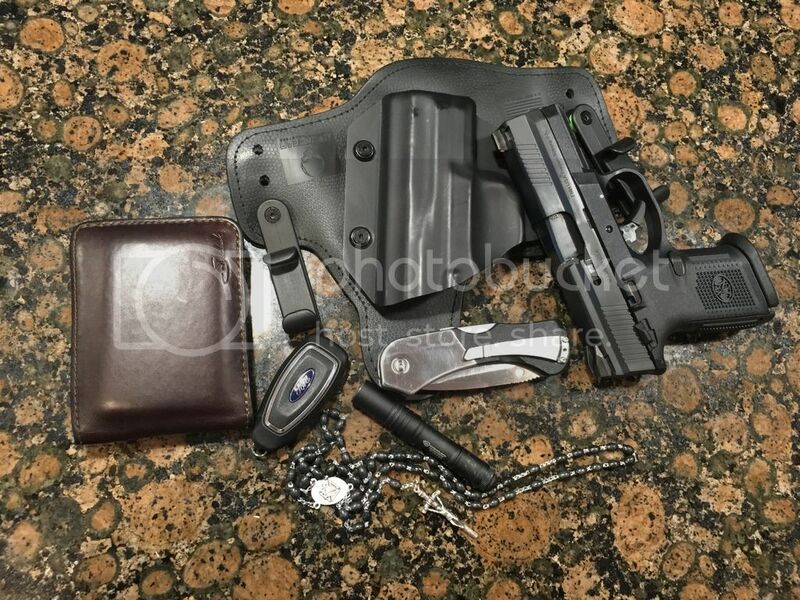 Found this topic while browsing the forums, and figured I would share my EDC. This is my typical, everyday carry. Somethings such as the cheap knife or pistol. Do not go with me into government buildings, i.e. courthouse. Also, should I have to wear more formal attire. I leave out a lot. Except for things like the Leatherman, glove pouch, mask, and so on. So as to not have unsightly bulges. There are a few other instances. Otherwise, I carry it all. People sometimes ask, "Why do you carry all of that?" Answer, "It might come in handy." "What are you going to do with all of that?" Answer, "Hope I don't have to use any of it. 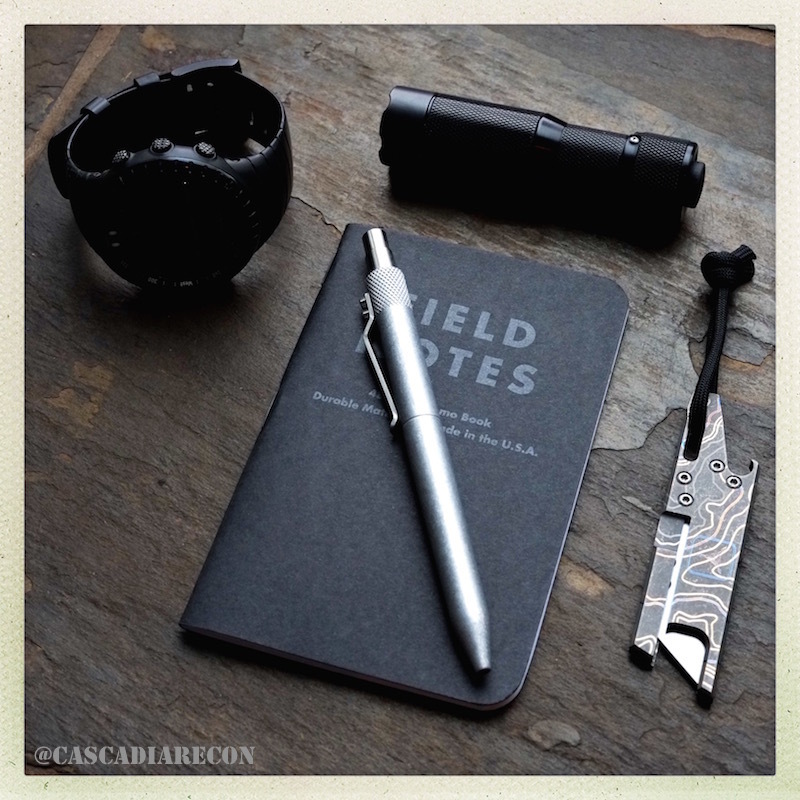 Rite-n-Rain Notepad with Rite-n-Rain pen. 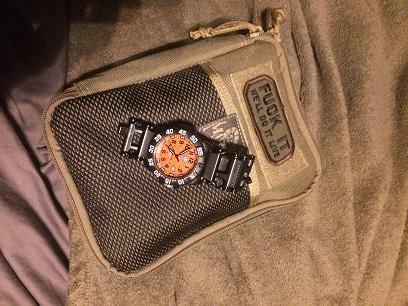 Not pictured: Blackhawk Riggers belt and Iphone. Edited by RabidWolf, 30 June 2016 - 06:51 PM. 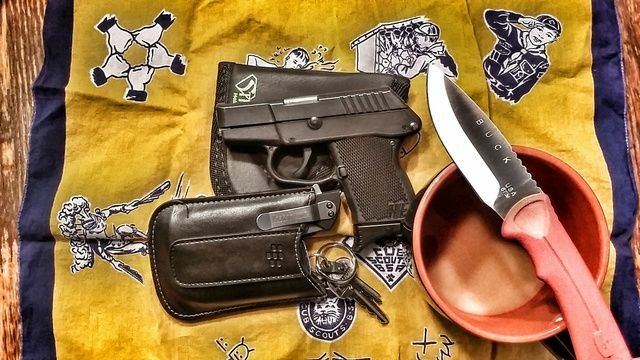 Evening&weekend carry (no deadly weapons on property rule at work). Edited by DeathwatchDoc, 16 July 2016 - 08:04 PM. Boots in there as they're laced with the ITS Kevlar laces ! Edited by SkutterK, 07 January 2017 - 09:02 PM. Finally got around to getting a picture of my current EDC. May seem excessive, but I'm still fine tuning. Love my Benchmade and CRKT both, so hard to not carry both. Feel free to opine. 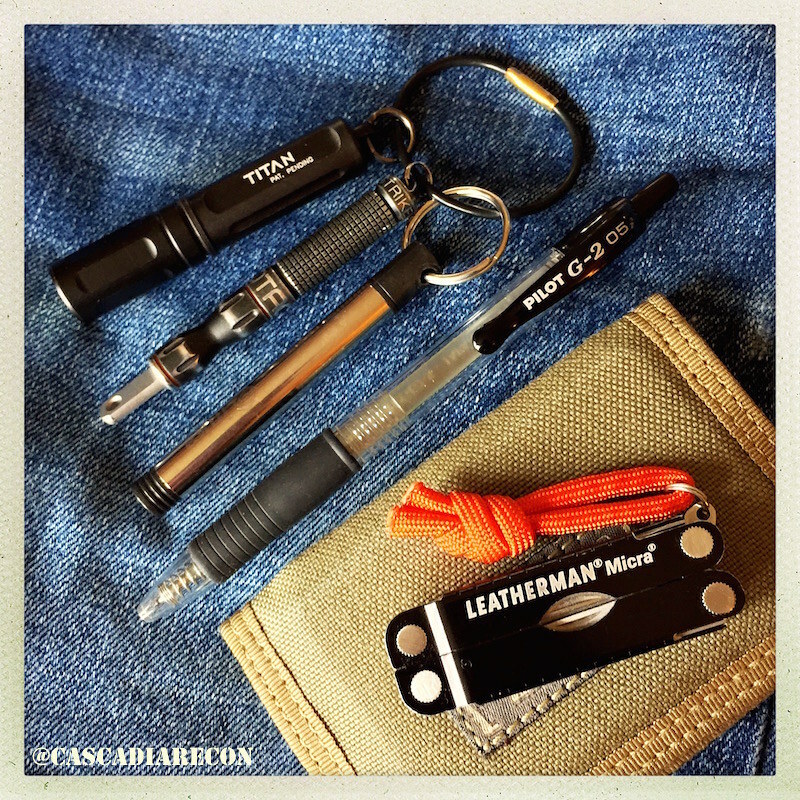 If you want to carry a pencil, carry a Staedler lead holder. They have an integrated pencil sharpener to get a wicked edge, the lead is thick so it doesn't break like mechanical pencils do. I carry one because I regularly freeze my rite in the rain pen at work. I can link to the pencil as soon as I successfully figure out how. It's never worked well for me. Updated my everyday watch with a new bracelet option. Found a company in BC that makes adapters to allow a tread to hold a watch. Fits like most metal bracelets. a nice option to have. I change the band based on what my day holds. if you have a tread this is a very handy upgrade. Edited by ducttapedave, 21 February 2017 - 11:59 AM. Edited by toxicspam, 15 July 2017 - 11:37 AM.